Summary: A prominent part of the St. Albert, Alberta champion Lacrosse team, Mike and his teammates are devastated when his RCMP dad Ben is transferred to Inuvit, Northwest Territories. Mike is even more upset when he finds out what his parents neglected to tell him – there is no Lacrosse team in Inuvit. The move turns out to be a positive change in Mike’s life though. He makes new friends, grows to love snowmobiling and is encouraged to learn more about his roots. His love of Lacrosse infects his new classmates, bonding them together when Mike’s dad sees them playing and starts an official team. Filled with talented and quick-learning players, Arctic Thunder has a real chance of winning an upcoming tournament against the team Mike used to play for. Review: Arctic Thunder by Robert Feagan is a bit young for my list, probably more suitable for pre-teen and reluctant early teen readers, but I truly enjoyed it. Mike starts out with typical teen angst. He’s fourteen years old and his parents are moving him away from Alberta and everything that is familiar to live in a town located in the Arctic Circle. Or, as Mike’s friend puts it quite dramatically, the North Pole. It’s actually Inuvit, a northern town in the Northwest Territories. If you are unfamiliar with the game of Lacrosse, Feagan’s book is for you. Lacrosse is Canada’s first official sport, developed by Aboriginals, but doesn’t get nearly the amount of attention hockey does. I loved learning about a sport I know very little about, especially since it turned out to be quite exciting and challenging. I liked how playing Lacrosse helped Mike make friends, and being on a team gave the teens something to take pride in. I think what I enjoyed the most though was the picture Feagan develops for his reader about life in the extreme north. In Inuvit, people from the provinces are considered southerners, and trusting them is a challenge for some. Certain types of travel are only suitable during specific times of the year with the use of ice bridges in the winter, and the love of nature and solitude is widespread. Mike grows to love his new surroundings, especially once he realises he can live there and still play Lacrosse. Donnie was my favourite character, and when he found a way to contribute to the Lacrosse team I was over the moon. Mike is a close second, because he’s a teen with a good head on his shoulders, not getting caught up in nonsense about befriending the geek and appreciating what Donnie has to offer as a friend. Feagan’s book is filled with great characters though, and the message of sports being a source of direction and accomplishment is a good one. Though it was a lighter read for me, Arctic Thunder was engaging and informative. I was satisfied with the ending, and happy Mike and his friends were too. 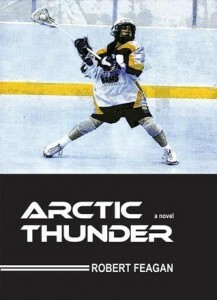 Arctic Thunder by Robert Feagan is published by Dundurn Press, (2010).